Anti-fatigue matting with bevelled safety edges. L x W mm: 790 x 710. Standing on your feet at work all day, whether it's behind a shop counter or on a manufacturing line, it can have negative effects, you can become lethargic and loose concentration due to the strain on your muscles. 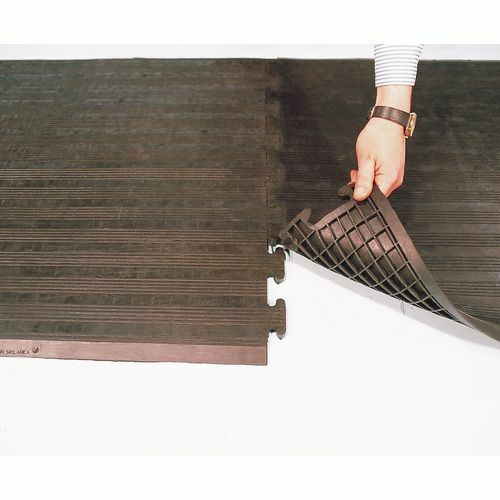 Our grid backed rubber safety matting is designed to keep you safe and reduce tiredness. They are anti-fatigue mats, giving underfoot comfort decreasing stress from the body, helping to avoid any aches and pains. There are bevelled edges for safety to prevent trips and they are slip resistant so you can feel confident walking over and standing on the matting. They are available as individual free standing mats or as interlocking sections so you are able to build a mat to suit your requirements. Our grid backed rubber safety matting will create a more comfortable environment for employees working on their feet all day, reducing fatigue and improving concentration, as well as positively impacting on productivity. They also come with a 12 month guarantee.